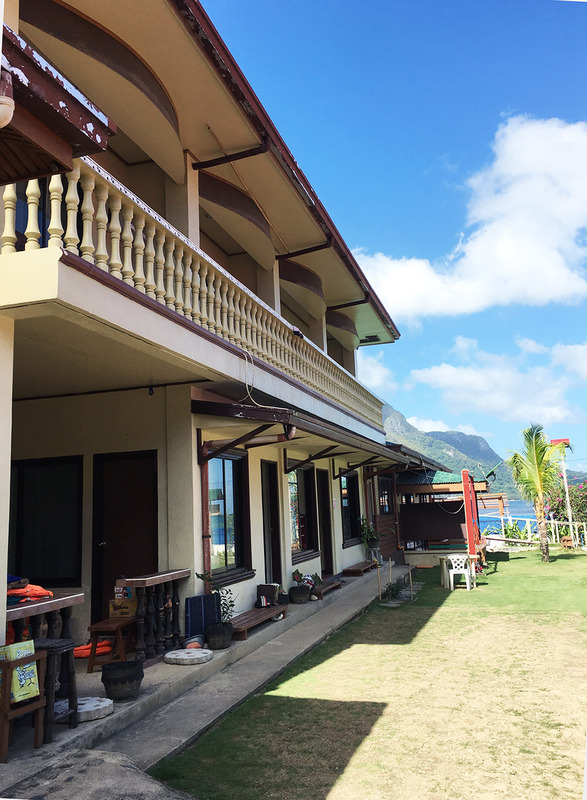 We have 14 rooms, all with either a view of the ocean or within a very quick walk to the beach. All of our rooms come with a very good (and free) continental breakfast, free wifi, air conditioning, private bathrooms and hot showers. We also offer complimentary usage of our snorkeling equipment. 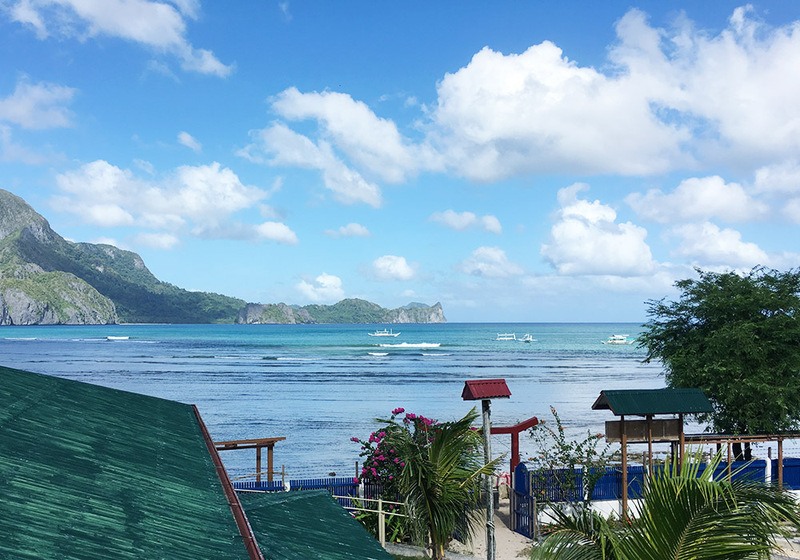 Oceanview is a two-story building with four rooms, and offers some of the best views at our resort. It is just 40 steps from the beach. 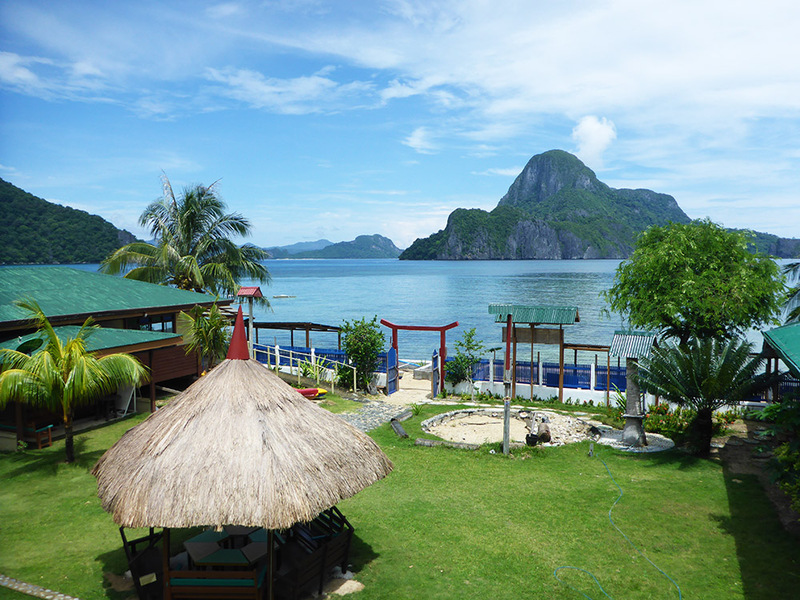 Oceanview’s view of the ocean and Cadlao Island, from the second floor (you can also see our green courtyard and shaded gazebo). 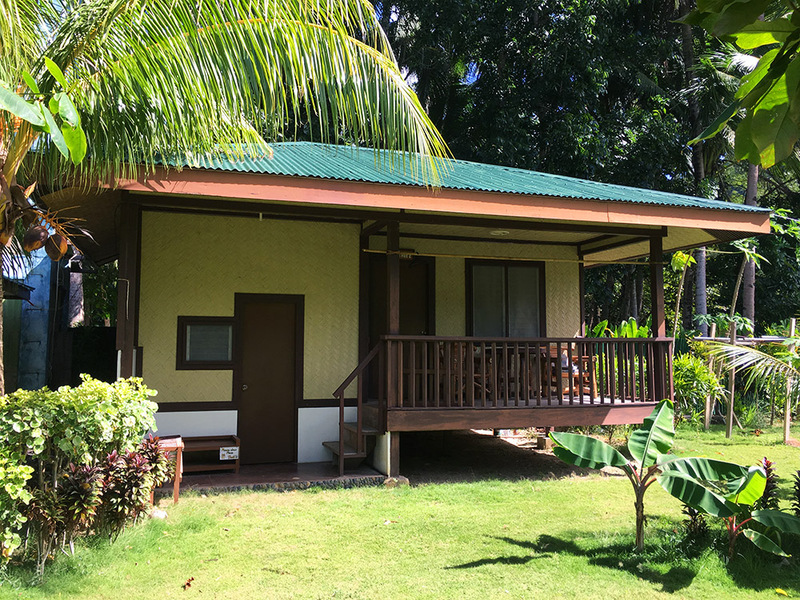 The rates for the rooms on the second floor (Oceanview 1 and 2) are slightly higher than the rooms on the first floor (Oceanview 3 and 4). More info on seasons is below. 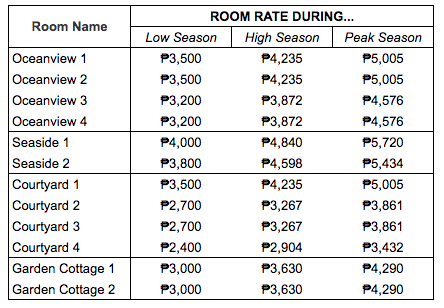 These room rates cover up to two guests in each room. 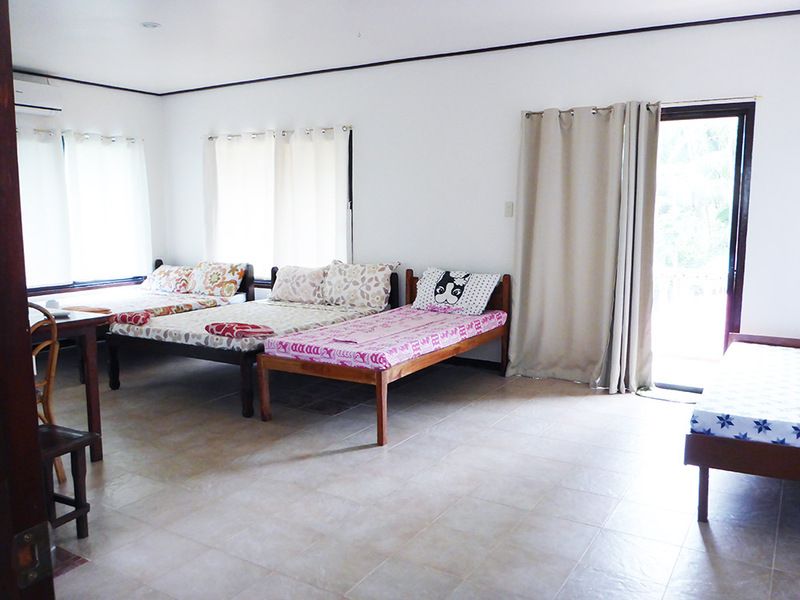 Any additional guests would be 500 PHP/night for an adult or child. 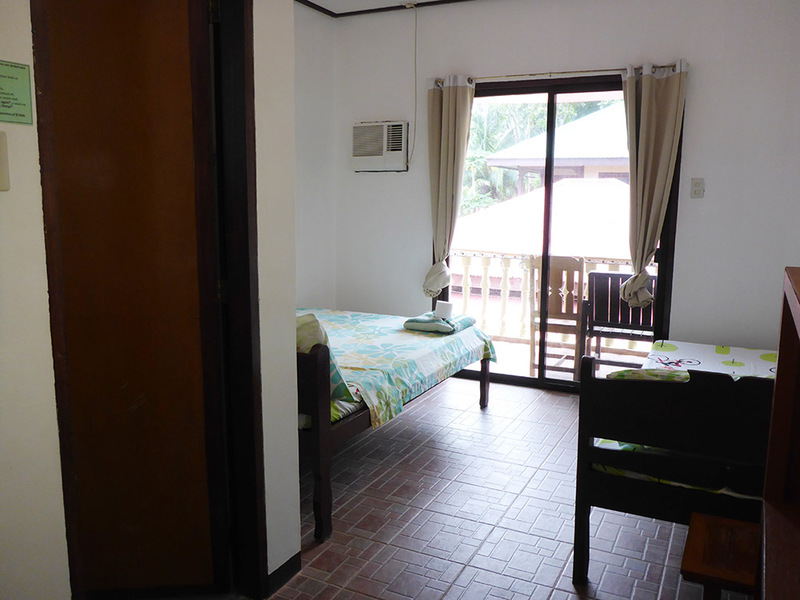 The rooms are approximately 30 square meters and have two double beds that can sleep up to 4 people. 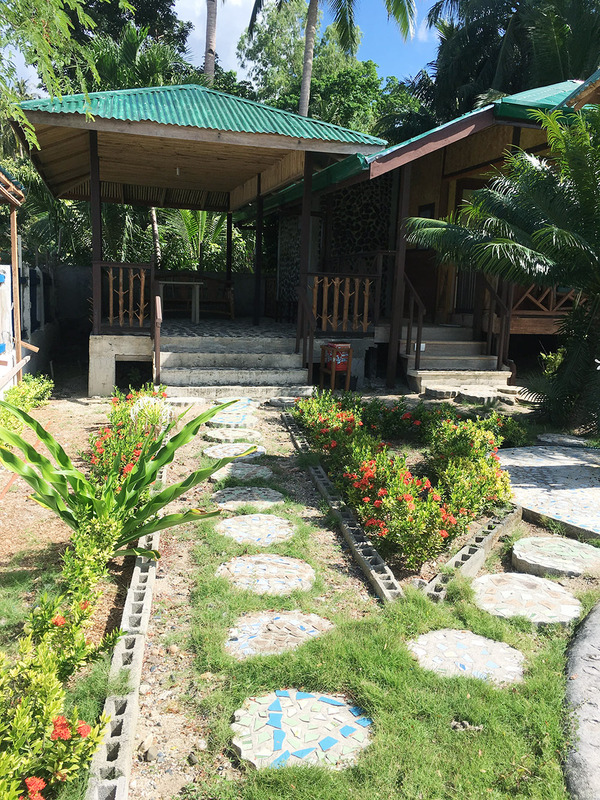 The Seaside lounge opens into a bed of flowers and shady trees, with a path that leads directly to the beach. There’s also a nearby outdoor shower, to rinse off when you’re coming back in from the ocean. 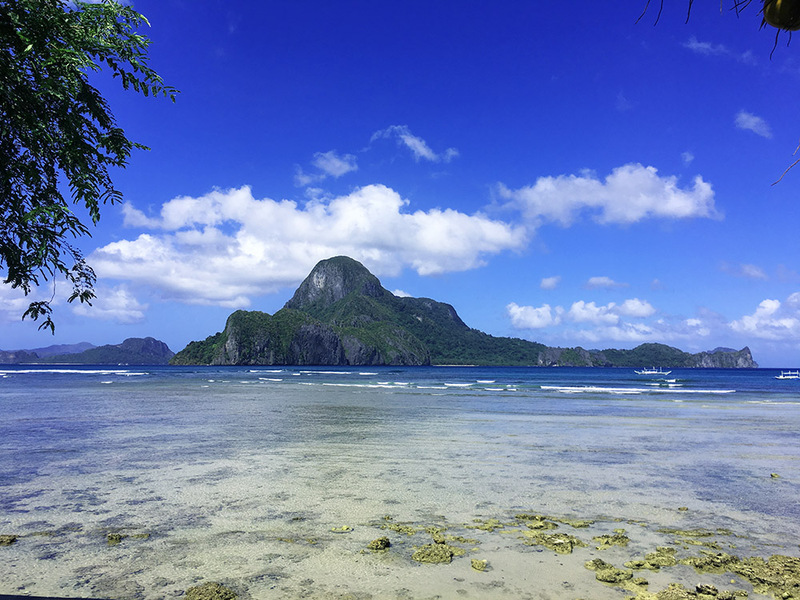 Seaside 1 is closest to the ocean and its room rate is slightly higher than the rate for its neighbor, Seaside 2. Both rooms get access to the private Seaside Lounge adjacent to Seaside. The view from Courtyard 1. The view from Courtyard 2 and 3 are similar. All of the Courtyard rooms have private balconies or porches, and the building is just 54 steps to the beach. Courtyard 4 is on the first floor, and has a private porch with seating. Courtyard 1 is one of the largest rooms in our resort, with 42 square meters of space. It has two doubles and two single beds, so 6 people can sleep here. 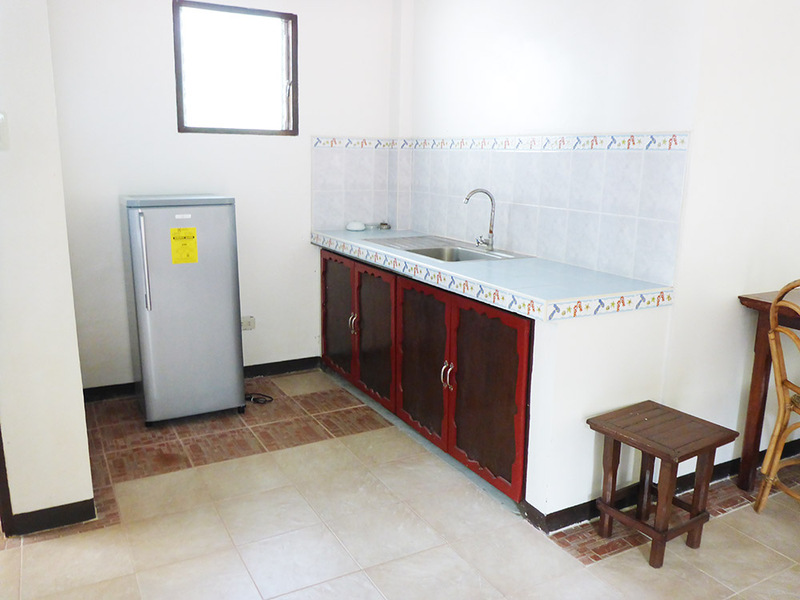 Courtyard 1 has both a kitchen sink and a fridge, making it great for large groups or families. Courtyard 2 and 3 are very similar rooms. Both are approximately 21 square meters, although Courtyard 3 is slightly larger and has more windows. 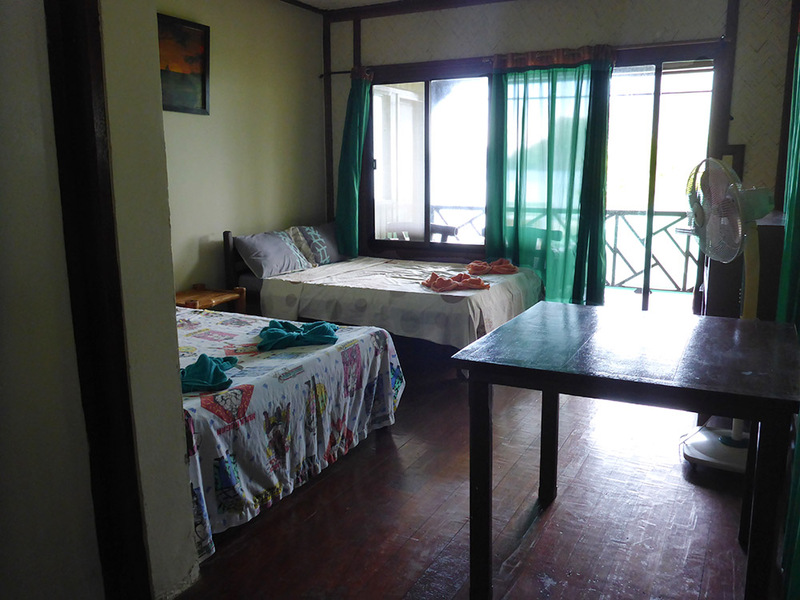 Both rooms have one double bed and one single bed (and sleep 3). Courtyard 4 is slightly larger than Courtyard 2 and 3, at approximately 25 square meters. 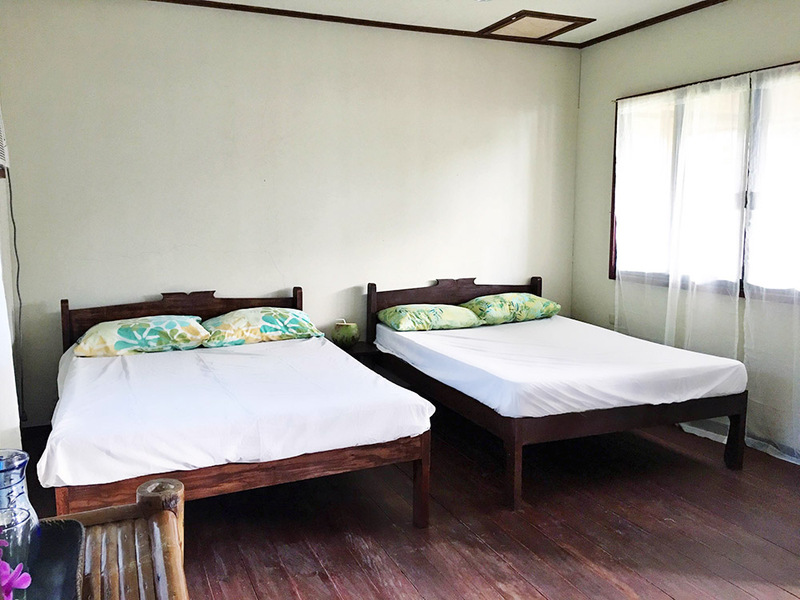 The room has 2 double beds, and can sleep up to 4 guests. Garden Cottages 1 and 2 are standalone cottages, and offer the most privacy for guests. 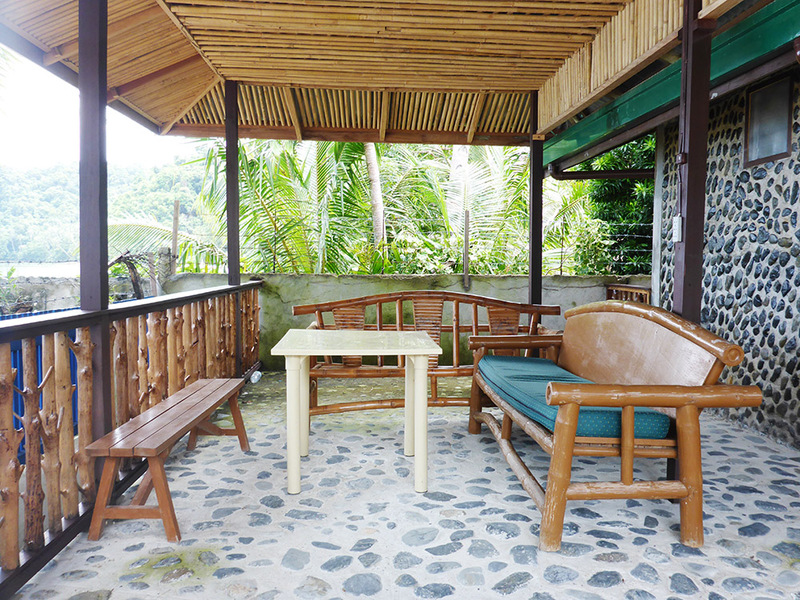 They both have private porches with seating where you can relax, and are 90 steps from the beach. 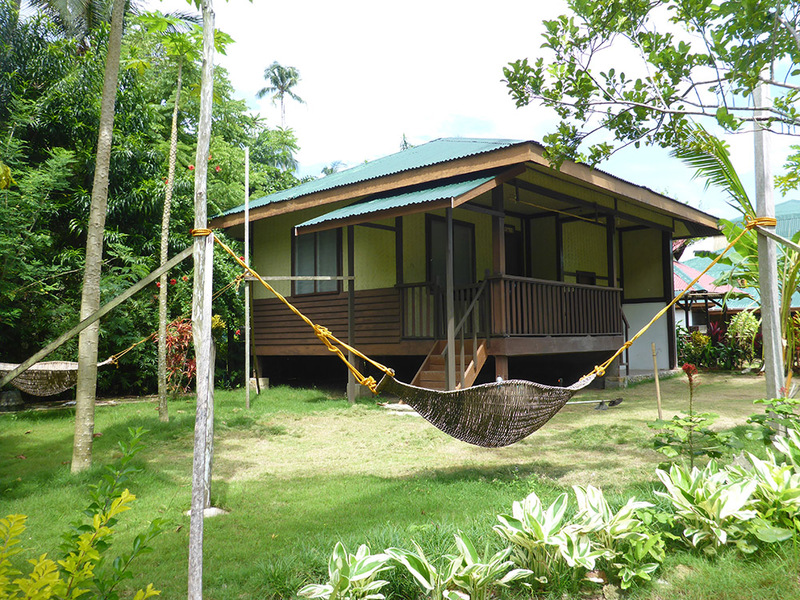 In the afternoon, the hammock at Garden Cottage 1 makes for a great place to relax or take a nap. Garden Cottage 2 overlooks our gardens, which grows many of the herbs and vegetables that are used in our restaurant. 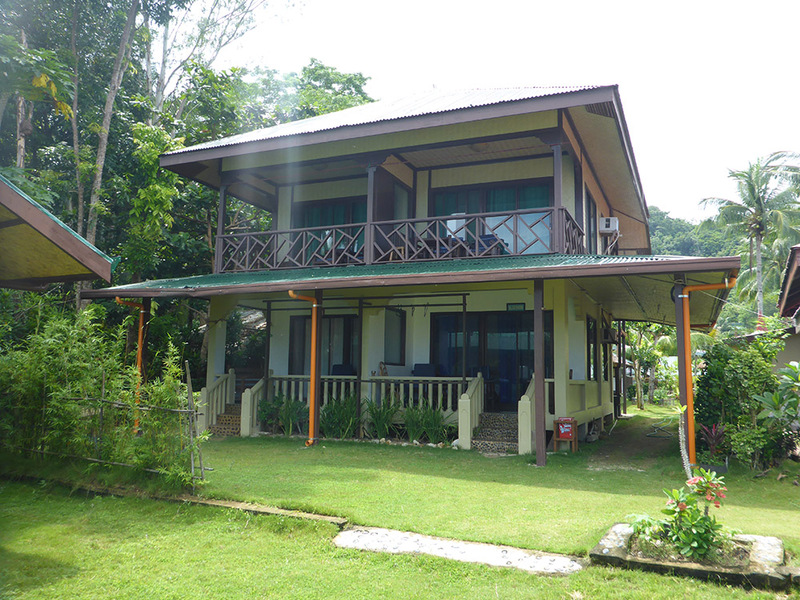 Each cottage is approximately 42 square meters, and can sleep up to 5-6 guests. 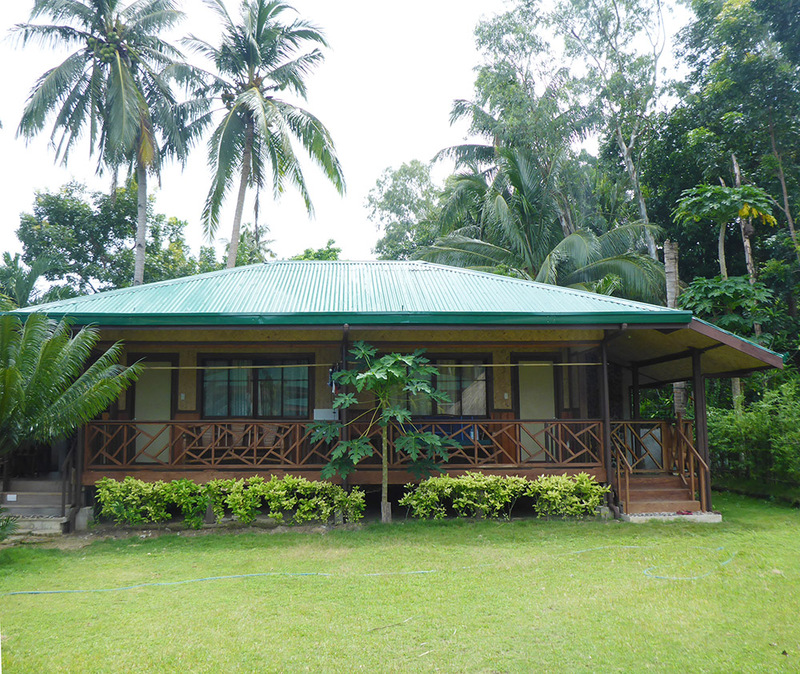 Each cottage has two double beds and 1 single bed, and an additional single bed can be added. As one of our largest rooms and with a kitchen sink area, Garden Cottages 1 and 2 are popular with large groups and families. “Low Season” is May 1st to November 19th. “Peak Season” includes Christmas to after New Year’s (December 18th to January 14th) and then Chinese New Years (February 2nd to 10th in 2019).